This accent desk is beautifully hand-crafted with turned legs and a convenient flip open drawer. The desk's versatile styling will complement any room. This Desk comes in two colour choices antique black or antique ivory. i3 Plus by Bestar has been created to adapt to your living space with the flexibility of its configuration possibilities. Its sleek design is Intelligent, Inspiring and Innovative. Durable 1 inch commercial grade work surface with melamine finish that resists scratches, stains and wear. The two storage units and the hutch are independent from each other, which makes this desk completely versatile. It features one file drawer with letter/legal filing system and five open storage compartments. Drawer on ball-bearing slides for smooth and quiet operation. Drawer is lockable. Square metal legs in matte silver finish. The hutch has one fix shelf. Fully reversible unit. Meets or exceeds ANSI/BIFMA performance standards. i3 Plus by Bestar has been created to adapt to your living space with the flexibility of its configuration possibilities. Its sleek design is Intelligent, Inspiring and Innovative. Durable 1 inch commercial grade work surface with melamine finish that resists scratches, stains and wear. The two storage units are independent from each other, which makes this desk completely versatile. It features one file drawer with letter/legal filing system and five open storage compartments. Drawer on ball-bearing slides for smooth and quiet operation. Drawer is lockable. Square metal legs in matte silver finish. Fully reversible unit. Meets or exceeds ANSI/BIFMA performance standards. The Student Desk with Metal Book Box is a sturdy addition to the classroom or a dedicated workspace for home schooling, homework and playing school.The high pressure laminate top is .625 inches thick with a black lacquer edge treatment for safety. Under the desktop is a spacious, heavy-duty, black metal book box with ample room for books, papers and other supplies. The one of a kind crisscross tubular frame ensures stability and the legs are height adjustable to fit students of all sizes. Adjustable nylon glides keep the desk from wobbling on uneven floor surfaces and protect your floors by sliding smoothly when you need to move it.This open-front desk is recommended for students from elementary all the way through high school. This desk, part JR Home Collection's Brownin series, offers a sleek, industrial feel with clean-lined silhouettes and open spaces. The light rusted brown is a 3D paper veneer that looks and feels like real wood grain, blending perfectly with the black powder-coated frame for a minimalist touch of appeal. Match with other pieces from the set for a cohesive look. Bella Desk This accent desk is beautifully hand-crafted with turned legs and a convenient flip open drawer. The desk's versatile styling will complement any room. This Desk comes in two colour choices antique black or antique ivory. Bella Desk is rated 5.0 out of 5 by 1. 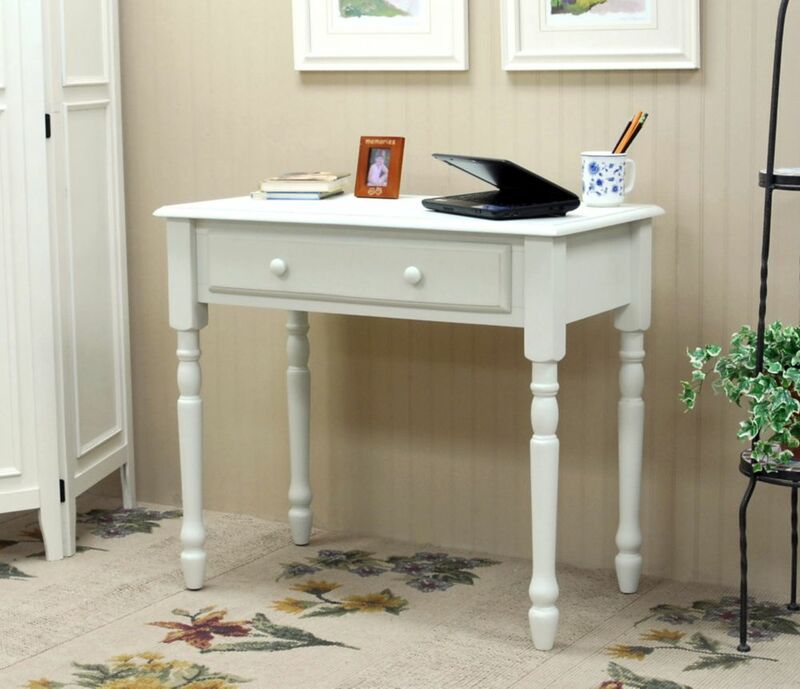 Rated 5 out of 5 by smartsmartshopper from Perfect Desk for small space! I am very happy with my purchase! I had read poor reviews about this desk on other sites... I love this desk! I am so happy I purchased this desk for my 12 year old daughter! We had a small space to work with and it just works so wonderfully! It is made well and I see us keeping this desk for many years to come!